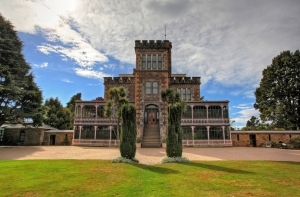 Even if the architecture of Larnach Castle was not so charming and if the castle garden was not so unique thanks to its various luxuriant flora, this building would not face any competition. 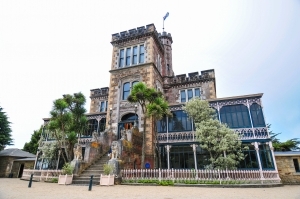 This is because the building, constructed as a family residence by William Larnach by the end of the 19th c. near the city of Dunedin, is New Zealand’s only castle! Today Larnach's residence was given a second life thanks to the Barker Family who restored this abandoned building to its original splendour and turned it not only into a popular tourist attraction but also into a cosy hotel, constantly putting much effort and care. Over the past several decades the Barker Family turned the abandoned Larnach Castle into one of the most distinctive attractions in Dunedin. Its sophisticated architecture, antique interior, wonderful garden and superb views over the coast are the reason why this castle, which is also used as a hotel, constantly attracts attention. Banquets, wedding ceremonies and conferences are held all year round within the Castle. The Victorian Winter Ball is very popular. It has already become a traditional event in Larnach's residence. Temporary exhibitions, master classes or thematic holidays are often held within this fortress. You can go on an interesting trip from the Castle to the site where royal albatrosses nest as well as to the places inhabited by rare yellow-eyed penguins. You cannot forget about the castle garden which has been blooming since the Barker Family began caring for it. Margaret Barker, who is not only a restorer but also a keen gardener, constantly cares for the castle garden. As a result, it was transformed into a complex of thematic parks. You can guess the variety of flora from the names of the garden parts; e.g. it features the Patterned Garden, the South Seas Garden, the Green Room, the Rain Forest, the Lost Rock Garden and others. A great fun, both for kids and adults, is provided by Alice's Garden where the funny characters from «Alice in Wonderland» by Carroll are. Among the lush garden plants is the Wishing Well. This is a must-see for those who believe in mysticism and miracles. 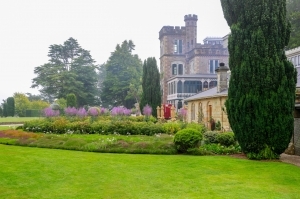 The New Zealand Garden Trust deservedly rewarded Margaret Barker for her efforts and designated the Garden of International Significance status to the garden in Larnach Castle.